These 18 inch blue pads are made to be used with walk behind or rider automatic floor scrubbers. 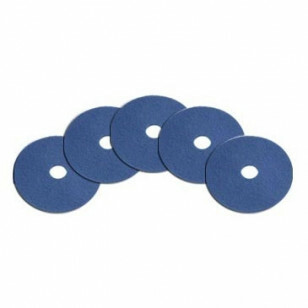 Blue pads are good for cleaning areas that are medium to heavily soiled. Each case contains 5 pads. Buy in bulk and save! Manufactured from 100% recycled materials. Please take a look at our complete line of floor scrubbing pads for additional colors and sizes.